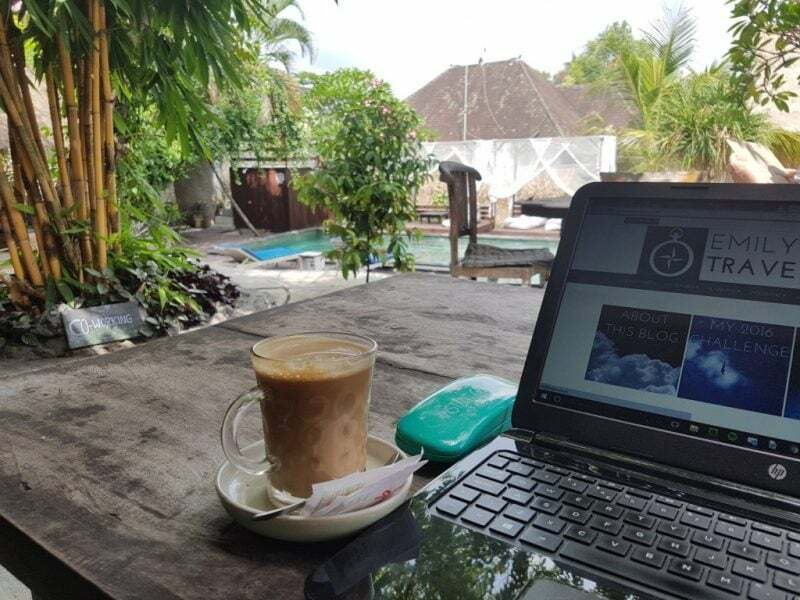 Welcome to my guide to the best hostels in Ubud – featuring recommendations from real travellers, including some awesome travel bloggers. This round-up covers all the best places to stay in Ubud if you’re visiting on a budget. 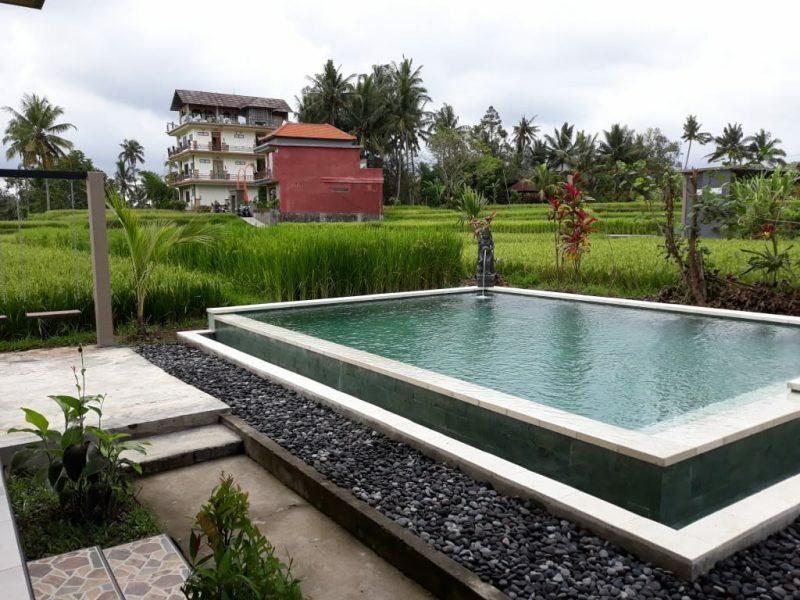 Hostels in Ubud Rice Fields – feel surrounded by nature in these fab hostels on the edge of town. Social Hostels – for folks who want to make friends – but still get a decent night’s sleep! Budget Hostels – cheap, cheerful hostels that won’t break the bank. FYI – this article contains affiliate links. Not sure what that means? Click here! Set in the leafy north of Ubud, there’s no better hostel location than In Da Lodge. You’re just a short walk into the centre of town and an equal distance to one of Ubud’s best hidden gems: the rice fields! Unlike the Tegallalang Rice Terraces that get hundreds if not thousands of visitors daily, the northern rice terraces are ideal for chilling out with a tasty lunch and iced coffee or taking a peaceful yoga class. When you’re not enjoying the location, In Da Lodge is the perfect hostel to hang out and make new friends. The rooms are all in classic Balinese style, resembling the unique Hindu temples the island is known for. Even though the price you’ll pay is tiny, you’ll have access to the swimming pool and the bar in the garden. Perfect! At Ubud Rice Field House, you’ll be surrounded by verdant rice fields, layered mountains, lush gardens, and tropical bamboo houses. It’s also located away from all the traffic of the main area of Ubud, perfect if you want to get away from the sounds of motorcycles and cars. There’s also a pool surrounded by rice fields – enjoy a spectacular sunset view while sipping on a delicious drink with new friends. Ubud Rice Field House has dorm rooms, as well as private rooms with wifi throughout the property. You won’t find a better deal with such beautiful and peaceful surroundings! Beds in the dorm start at $9 per night. Green Paddy Hostel is one of the highest rated hostels in Ubud on Hostelworld, and it looks gorgeous. However, I haven’t stayed here myself so I can’t vouch for it. I’m usually pretty good at picking out the best of the bunch using Hostelworld reviews, though – and this hostel looks lush! Balinese style wooden bungalows are dotted around a central infinity pool, all overlooking the rice fields on the outskirts of Ubud. Looks like it could be the perfect escape if you want a quiet, clean and comfy place to stay in Ubud! 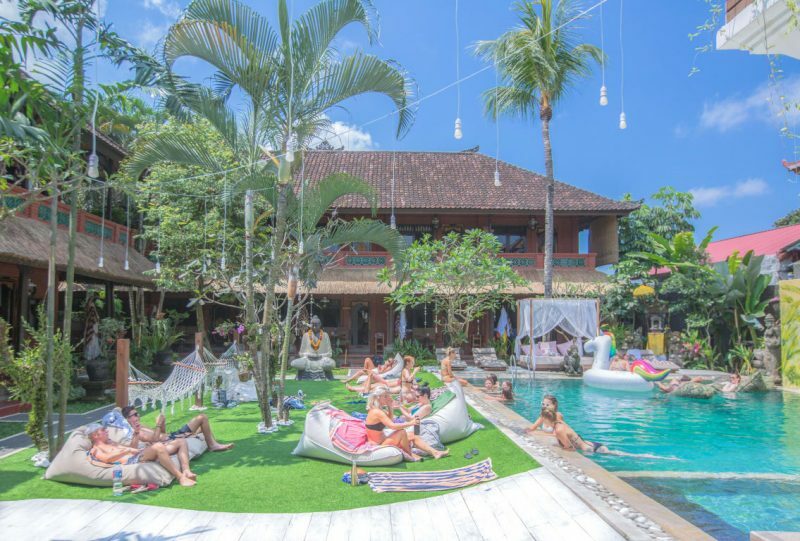 If you’re looking for the best hostels in Ubud to meet fellow travellers and enjoy a social atmosphere, these are the top picks! They might be less fancy than the rice field villas, and they’re often pretty basic. But they make up for it with great atmospheres, and lot’s of fun social events. I stayed at the Joker Hostel in Ubud a couple of years ago and loved it! This is definitely one of the best places to stay if you want to meet people. There are really fun, friendly vibes and I made some awesome friends at Joker – some of whom I’m still in touch with today. And the staff were all super sweet and really welcoming. The hostel itself is pretty simple, but it’s comfy enough and really well priced. I loved the little garden area, perfect for sitting around in the evening to chat and drink a few beers. There’s also a kitchen, which is always useful if you’re travelling on a tight budget. Although it’s definitely not a party hostel, the dorms weren’t very sound-proof so you could often hear the people chatting in the common areas. Bring some earplugs and you’ll be ok! Puri Garden Hotel & Hostel is a hip place to stay in Ubud. 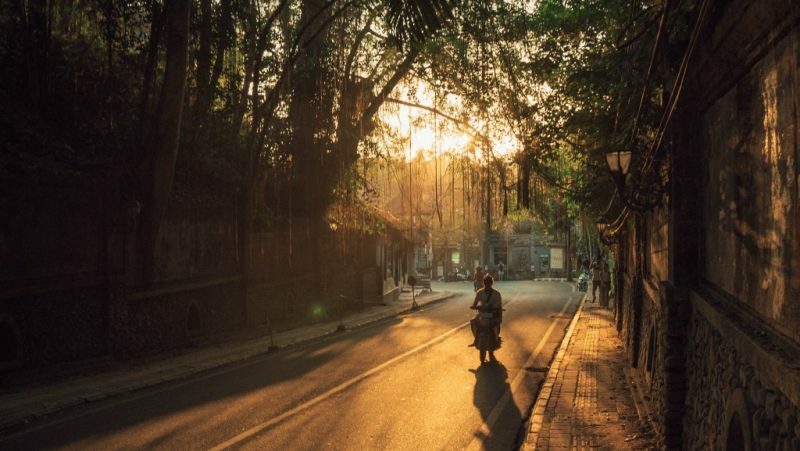 Located just a short walk away from the center, Puri Garden is comfortable, clean, and beautiful. The dorms have privacy screens and super comfy beds. The private rooms are really nice if you want to splurge. Staying at Puri Garden comes with free morning yoga sessions set in their beautiful gardens; a great way to start the day. 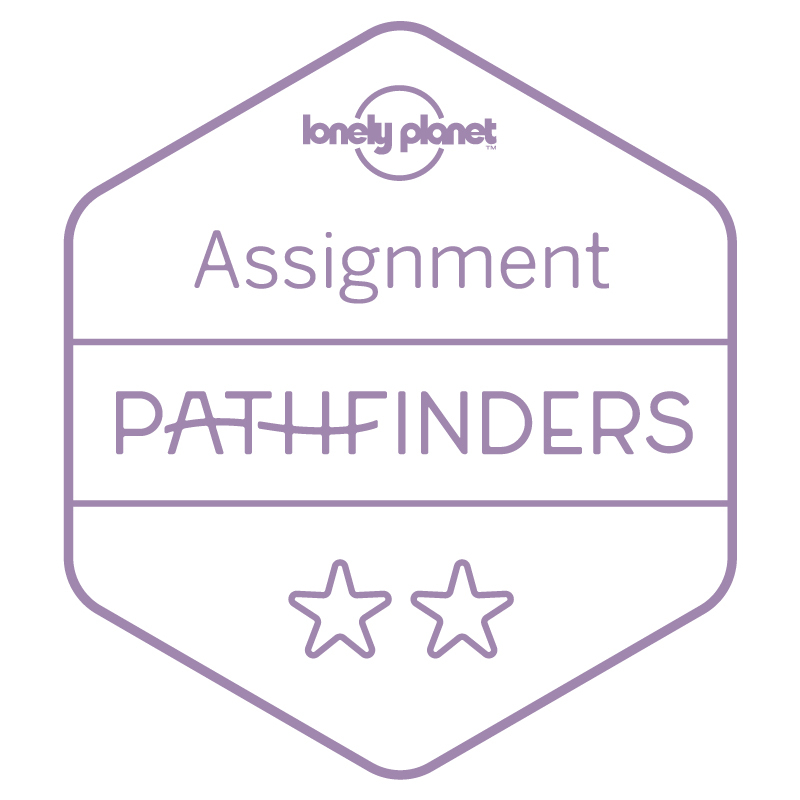 This is the perfect place for a solo backpacker to meet new people. There are plenty of social activities, such as barbeque nights and movie nights. The pool is a great way to cool off after a hot and sweaty day of exploring local Ubud. I didn’t actually stay at the Onion Collective, but I spent a lot of time in the co-working cafe there and met a lot of great backpackers and digital nomads. So I can definitely vouch for the social aspect of the property! There’s a mixture of beautiful private rooms, and simple but comfy looking dorm rooms. There’s even a queen bed dorm if you want a bit of extra space to starfish (or, ya know, share with a partner)! Plus this hostel has a pool, a beautiful garden area, and a fab little cafe. The vibes are super relaxing and there are lots of awesome people around. Plus they seem to host quite a few events, which are always a good way to meet people. Check Prices: Booking.com | AirBnb. 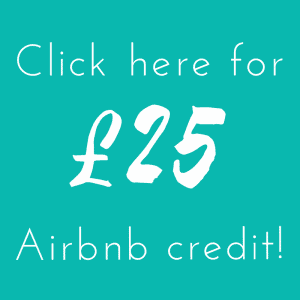 If it’s your first AirBnb booking, use my link to sign up and you’ll get £25 off your first booking! Another one of the highest rated hostels in Ubud on Hostelworld is the fab looking Pillow Inn. Again, I’ve not stayed here myself – but the reviews are all super positive and a lot of people mention the great atmosphere. 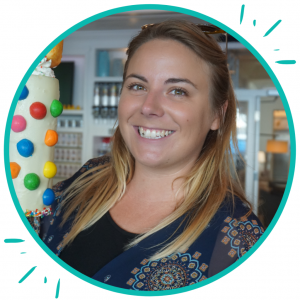 Many recent reviews talk about how easy it is to meet people at this fun hostel. There’s a pool – complete with floaties for those all-important Instagram shots – and a cool bar with a massive terrace. The leafy garden looks like a great place to chill during the day, and there’s free yoga every Wednesday and Friday. But the bar and restaurant look pretty lively at night, so you have the best of both worlds. And with lots of social events running, it’s definitely a hostel with good social vibes. I was visiting Bali on a budget – and Ubud was the end of my trip. This meant that I had to find somewhere very cheap to stay! Luckily, Taman Dewangga House pulled out all the stops. I wasn’t sure what to think at first, as it was incredibly cheap – 40,000 rupiah plus breakfast?! – but it really is a great budget place to stay. The main courtyard of Taman Dewangga is wonderfully serene, with a fountain and traditional Balinese decorations. The staff are very helpful and gave me early check in, which was much appreciated. I stayed in an 8 bed dorm room, but there are private rooms available. The dorm rooms feature bunk beds with their own light and plug with a shared bathroom. Privates get a few extra frills! The breakfast is eggs, bread and fruit as well as tea or coffee. The property is located right in the heart of Ubud, near temples, shops and restaurants. 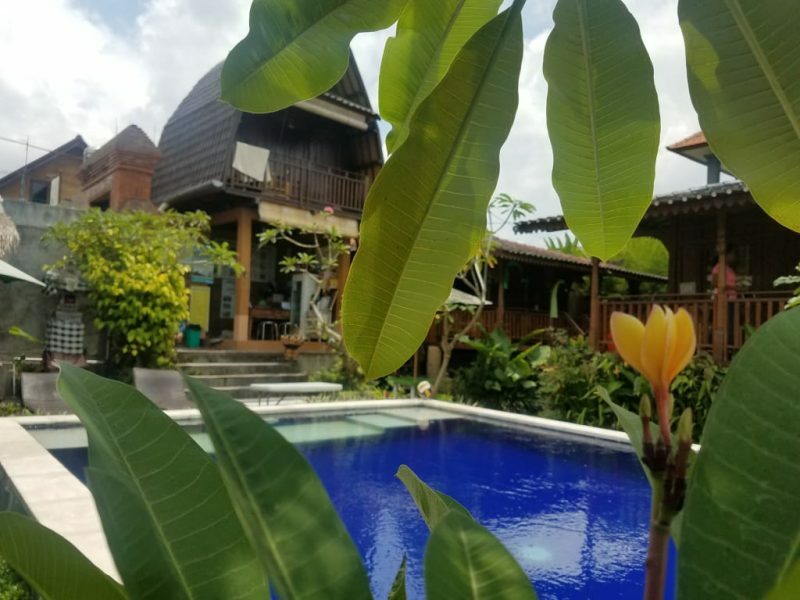 This is another of the best rated hostels in Ubud on Hostelworld – and with such clean, stylish dorms at such bargain prices I had to include Kememai Hostel on this list. Just look at that dreamy breakfast view from the rooftop terrace! I’d stay here just for that! All the recent reviews chat about how clean and quiet this hostel is. So if you’re looking to chill, somewhere on the edge of central Ubud, this could be the place. However, a lot of people mention that it’s not a great place to meet fellow travellers. If you want a lively atmosphere, consider one of the more social hostels above. But if it’s a good night’s sleep and some chill time you’re after, Kememai Hostel might be a great place to stay in Ubud! Do you know any more great hostels in Ubud? Get in touch, or leave a comment, and I’ll add them to the post! thats a pretty comprehensive looking list! The pools look so inviting! I know!! Hostels have changes so much since I started backpacking!! !